He was unarmed and was in the company of a local barangay official when he was arrested without warrant. He was held for three days without charges and was subjected to continuous tactical interrogation by the military. He has been charged with illegal possession of explosives and is detained at the Calbayog sub-provincial jail. Handling his defense is a legal team from the National Union of People’s Lawyers (NUPL), led by Atty. Jun Oliva and Atty. Rey Cortez. He has worked in the media as segment writer for ABS-CBN’s Wanted TV Patrol and assistant entertainment section editor of the Manila Times. His works as a poet and songwriter have remained relevant especially to the succeeding generations of activists in and out of the university. He helped in the reestablishment of the Concerned Artists of the Philippines (CAP) during EDSA II, and has worked closely with the peasant sector. His bias for the poor and oppressed dates back to his campus days. 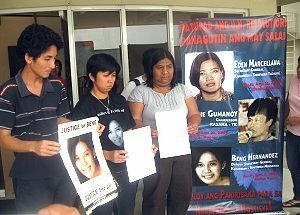 Supporters of the Free Ericson Acosta Campaign also include veteran actors Fernando “Nanding” Josef, Rody Vera, Pen Medina, and Bonifacio Ilagan; Dean Roland Tolentino of the UP College of Mass Communications; Dr. Alice Guillermo of the UP College of Arts and Letters; former Dean of the UP College of Fine Arts Neil Doloricon, poets and literary critics Dr. Gemino Abad, Gelacio Guillermo, Prof. J. Neil Garcia, Jun Cruz Reyes; poet Richard Gappi of the Neo-Angono Artists’ Collective and former political detainee Axel Pinpin of the Tagaytay 5; visual artists Egai Talusan Fernandez, Boy Dominguez, Mideo Cruz, and Julie Lluch; filmmakers Sigfried Barros Sanchez, Kiri Dalena, Carlitos Siguion-Reyna and Bibeth Orteza; poet and musician Jess Santiago, rock musicians Chickoy Pura of The Jerks and Eric Cabrera of Datu’s Tribe, and journalists Elizabeth Lolarga, Kenneth Guda, Norman Bordadora, K Alave and Iris Pagsanjan. 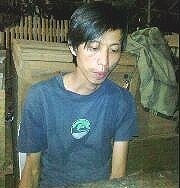 “I know him (Ericson Acosta) personally as a cultural worker. I am humbled by his sacrifices and his commitment to the poor. My accomplishments as an artist and cultural worker are nothing compared to his," Josef added. Even in detention, Acosta struggles to make his voice heard. A raw recording dubbed “Prison Sessions” uploaded by BAYAN Secretary General Renato Reyes, Jr. – who on his April 6 visit to the Calbayog jail played acoustic guitar while Acosta sang some of his original compositions for Alay Sining – instantly generated thousands of hits on its first few days on the web. “My active engagement through my writings naturally serves to effectively amplify the campaign, as well as the general call to free all political prisoners,” he said, despite having writing difficulties given dreadful conditions in prison. TACLOBAN CITY – The City of Baybay and five other municipalities signed a Memorandum of Agreement (MOA) on April 7, 2011 with the Department of Environment and Natural Resources (DENR), Department of the Interior and Local Government (DILG) to firm up their roles on co-management of natural resources in the area. From left Leyte Board Member Hon. Cayunda, Vice President Guarte of VSU, Mayor Cari of Baybay City, Reg. Dir. 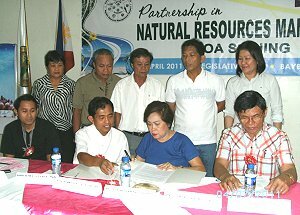 Jose of DILG signing the MOA on Co-Management of Mangrove and Foreshore Area of the 5th District of Leyte (Baybay, Inopacan, Hindang, Hilongos, Bato and Matalom) as witnessed by City Agriculturist Elena Siddiqui and Sangguniang Panglungsod of Baybay City. Mayor Carman Cari of Baybay headed the mayors of six local government units – Baybay City, and the towns of Bato, Hilongos, Hindang, Inopacan and Matalom in forming an Integrated Municipal Fisheries and Aquatic Resources Management Council (IMFARMC) to help administer laws in proper management of natural resources within their boundaries. The MOA signing was held at the city Legislative Building which saw the mayors of the concerned municipalities, and the representatives of the Visayas State University, DENR, BFAR, PNP and other offies declare their pledges of commitment for the undertaking. DILG -8 Regional Director Francisco Jose was also on hand to lend his support. The MOA sought to harness support from the above-mentioned offices in order to fully implement the provisions of joint memorandum circular 98-01 of DENR and DILG, as well as DENR Department Order No 92-30 which provided guidelines on transfer and Implementation of DENR functions devolved to LGUs as mandated in the Local Government Code. LGUs now share with the DENR the responsibility in sustainable management and development of the environment and natural resources within their territories. Among those present in the event were BFAR Reg. Dir. Juan Albaladejo; Dr. Roberto Guarte, VSU Vice President; PNP Provincial Director PSSupt. Pio Manito, PENRO Robin Tumolva, Atty. Dan Suarez, OIC-CMMD of DENR; Board Member Florante Cayunda, Mayor Silvestre Lumarda of Inopacan, and Mayor Nathaniel Gertos of Bato. The MOA signing is expected to spur efforts of LGUs and the national government to protect natural resources even while allowing for sustainable development in these areas. 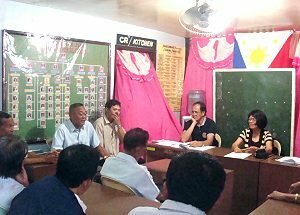 CATBALOGAN CITY – The Sangguniang Panlungsod recently passed a resolution urging the Department of Education to take the lead in conducting school-based Information, Education and Communication campaigns about Ecological Solid Waste Management. The resolution, which was passed through the motion of City Councilor Stephany Uy-Tan last March 30, 2011, urged the Department of Education-Samar through Schools Division Superintendent Dr. Alfredo D. Dacuro to include Ecological Solid Waste Management discussions in the school curricula and take the lead in the Information, Education and Communication campaign by reactivating the Youth for Environment in School Organization (YES-O). It was in September 01, 2003 when DepEd Order No. 72 series of 2003 was first issued ordering the establishment of the Youth for Environment in Schools Organization (YES-O) in every public and private elementary and secondary schools. This move by the SP gets legal backing from RA 9512 or the "National Environmental Awareness and Education Act of 2008", explicitly mandates the Department of Education to conduct environmental awareness campaigns, programs and projects. Although the resolution has yet to be personally handed over by Councilor Uy-Tan to Dr. Alfredo D. Dacuro, the City Government of Catbalogan believes that environmental preservation and solid waste management concerns must be dealt with on various fronts and that educating young students on these through activities like a regular ten (10) minute discussion in science subjects, trainings, symposia and others can be an effective strategy. If reactivated, environmental awareness campaigns would be very much similar to the ones conducted by the Catbalogan I District Elementary School last March 25, 2011 at the New Life Christian Center. 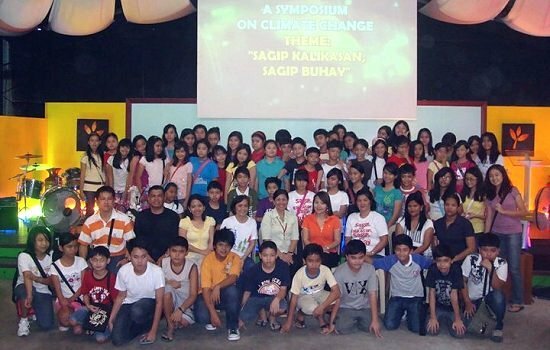 Under the theme, "Sagip Kalikasan, Sagip Buhay", Catbalogan I conducted a symposium on climate change along with a video presentation and was participated in by nearly a hundred students from the said school's Special Education Class. The activity was conducted in cooperation with the City Government and the Department of Environment and Natural Resources. In behalf of the City Mayor Coefredo T. Uy, City Councilor and City Council Committee on Environment and Natural Resources Chair Stephany Uy-Tan urged her student audiences to do their own part in protecting the environment. "We need to protect our environment because we only have one earth. Not for ourselves but for our children and their future", she said. The highlight of the event was the lecture given by DENR Forester Mr. Baldomero Nunez who gave a comprehensive discussion on environmental preservation and protection. At the end of the event, pupils from Catbalogan I were informed and motivated on the immediate need to protect and preserve our environment. CALBAYOG CITY – While the Sanggunian is working on the immediate approval and implementation of the Comprehensive and Integrated Solid Waste Management System of the City, the first batch of “Trainors’ Training on Waste Analysis and Characterization Survey” (WACS) was conducted on April 6, 2011 at the Sports Center. Since the law mandates that the segregation and collection of solid wastes (specifically biodegradable, compostable and reusable wastes) shall be conducted at the barangay level, and the non-recyclable materials and special wastes shall be the obligation of the city through its private garbage collector; the Solid Waste and Management Office (SWMO) required the barangay officials or its representatives to undergo WACS training. From among the 22 service areas, the city has an existing 8 Material Recovery Facilities (MRF) that are operational – receive, separate, and prepare recyclable materials for marketing to end-user manufacturers. On the other hand, WACS is the process to determine the total weight and volume of wastes and verify the composition of waste materials being disposed per day, assess the actual value of the 30% required diversion and identifies the kind of waste for diversion from the disposal facility. According to 2006 study on Characterization and Quantification of Residuals from Material Recovery Facilities, the purpose of the material recovery facilities (MRF) residual characterization was to obtain a complete picture of the disposal and recovery potential for MRF residuals in order to allow evaluation of potentially applicable recovery strategies including processing and conversion technologies. CSWM Chair Ronald P. Aquino said that in the new solid waste management system, the city will implement color coded and numbered sacks, impose schedules of bulky garden wastes collection, no use of plastic bags and will enforce stricter penalties for non-compliant or violators. He warned the people not to burn household garbage like recyclable items, yard or garden wastes. Said human activities are contributing to global warming by adding excessive amounts of greenhouse gases to the atmosphere; Greenhouse gases such as carbon dioxide accumulate in the atmosphere and trap heat that normally would exit into outer space, he added. He also said that dumping of garbage in non-designated areas and pick-up points are also prohibited as it becomes a breeding ground for disease causing organisms. Vice-Mayor Aquino believed that achieving a hundred percent compliance involves a laborious task considering that Calbayog is composed of 157 barangays and considered the third largest city in the Philippines. But as head or architects of their respective territories, it needs good strategy. “If you fail to plan, you plan to fail”, he said. He encouraged the people to begin with a single step and rectify previous mistakes. TACLOBAN CITY – A Memorandum of Agreement (MOA) will be signed on April 7, 2011 (Thursday) between the Department of Environment and Natural Resources (DENR), Department of the Interior and Local Government (DILG) and six coastal local government units in the western side of Leyte on co-management of natural resources in the area. It was learned that the six LGUs – Baybay City, and the towns of Bato, Hilongos, Hindang, Inopacan and Matalom had formed an Integrated Municipal Fisheries and Aquatic Resources Management Council (IMFARMC) to administer laws in proper management of natural resources within their boundaries. They sought to harness support from the above-mentioned offices in order to fully implement the provisions of Joint Memorandum Circular 98-01 of DENR and DILG, as well as DENR Department Order No 92-30 which provided guidelines on transfer and Implementation of DENR functions devolved to LGUs as mandated in the Local Government Code. LGUs now share with the DENR the responsibility in sustainable management and development of the environment and natural resources within their territories. Baybay City Mayor Carmen Cari will host the gathering to be held at the city Legislative Building at 8 o’clock in the morning, which will feature pledges of commitment from the mayors of the concerned municipalities and the president of Visayas State University, Dr. Jose L. Bacusmo. Messages of support are expected from Leyte Governor Carlos Jericho L. Petilla, DENR Regional Executive Director Primitivo Galinato Jr. and DILG Regional Director Francisco C. Jose. Leyte 5th district congressman Jose Carlos L. Cari is likewise slated to address the activity. The MOA signing is expected to give impetus to efforts of LGUs and the national government to protect natural resources even while allowing for sustainable development in these areas.